Praise for Navigating Legal Landmines: A Practical Guide to Business Law for Real People. For the sake of all that is holy, don’t ever get caught saying, “If I only knew this BEFORE…” Too many businesses are vulnerable to unexpected legal issues which could easily be avoided. This book will prepare you for the unexpected. Read it now. 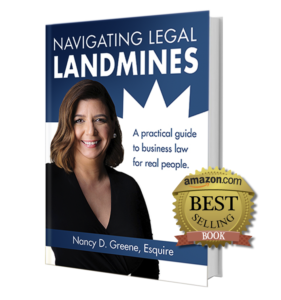 Navigating Legal Landmines is a must-read for every entrepreneur! Nothing is worse than making a costly mistake that you could have easily avoided had you only known the legal landmines that were in your path. Most small business owners work incredibly hard to earn revenue. Nancy’s insights will ensure that you get to keep it! –Sandra Yancey CEO and Founder of eWomenNetwork, Inc.
Nancy—loved your book. I wish I had had it prior to publishing mine. It would have prevented a lot of landmines in my career. I love your insights. – Laura Herring, Ph.D. Founder and Chairwoman of IMPACT Group, a global, WBE-certified career development firm, and author of No Fear Allowed. What’s missing from most entrepreneur’s bookshelves? An easy-to-read, practical book about business law. Why? 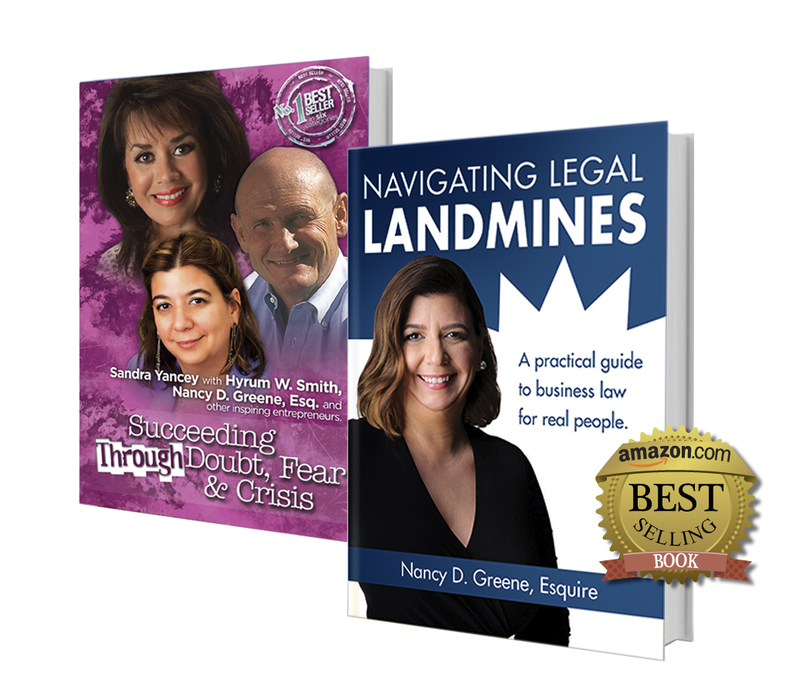 Because until Nancy wrote Navigating Legal Landmines, it didn’t exist. This book is a must read for entrepreneurs. 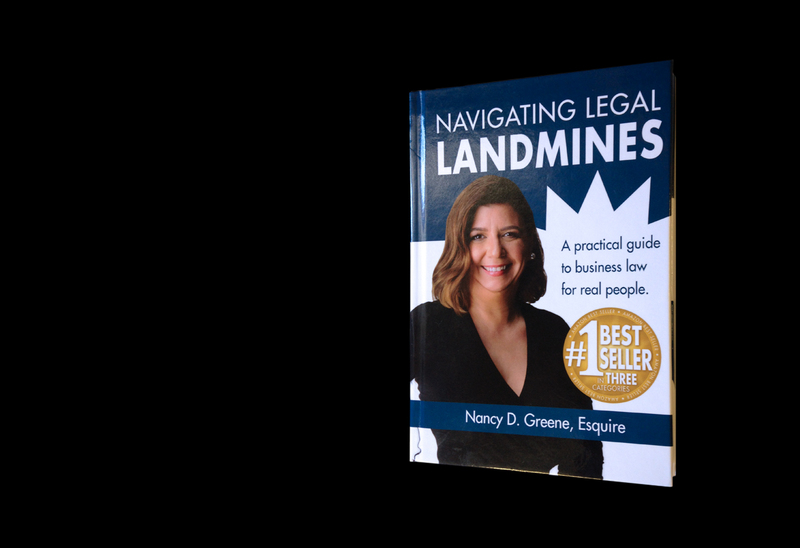 Navigating Legal Landmines is a MUST read for all entrepreneurs! True to Nancy’s no-nonsense style, this book lays out the key landmines that all business owners need to be aware of. This book is written in a clear concise manner and provides practical insights for protecting you and your business. Definitely worth the read. We are all too familiar with the dangers our military face from enemy mines and the consequences when they fail to discover them until it’s too late. We can be thankful that we don’t have to deal with those things in our own lives. Yet, as Nancy Greene so clearly points out, any of us running a business, large or small, face a field of legal landmines that can disable or even kill our businesses and have serious impact on our personal lives. In this new book Ms. Greene shows you how to anticipate, navigate or totally avoid these situations and, most importantly, have the professional help and documents ready to handle them when they inevitably arise. This is a book of tremendous value to anyone in business, whether it’s a start-up or one that’s been around for a while. I’ve had the chance to get to know Nancy Greene and even mentor her a bit, and she’s the real deal with the knowledge to take you through the daily business minefields. – Ken Kragen MBA Harvard Business School Recipient of the United Nation’s Peace Medal Organizer of We Are The World, Hands Across America, etc. What you don’t know about the law can hurt your business. So often, entrepreneurs face heartbreak—loss of savings, loss of business, loss of important relationships—because they did not know the common legal mistakes that could have been avoided. But how can business owners find the legal landmines hidden all around them, when business law seems so complicated and difficult to understand? In her new book, Navigating Legal Minefields: A Practical Guide to Business Law for Real People, business lawyer and litigator Nancy D. Greene demystifies all that fancy legal-mumbo-jumbo and helps entrepreneurs leverage the law so they can run their businesses with confidence, develop better working relationships, and protect their dreams. Print and Kindle editions available at all online and brick-and-mortar retailers, including Amazon, Barnes & Noble and Powell’s.